The Third episode of STARZ Outlander is aptly titled The Gathering, and what a gathering it is! Not only do Colum’s clansmen gather to give him their oath, but they participate in a boar hunt as well. 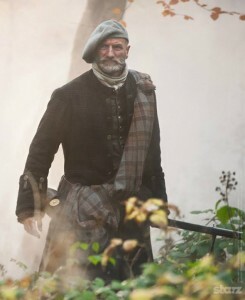 This episode takes those reading the book through the end of the tenth chapter, and Part II of the book (page 200), though the book blatantly states what the show only implies, that not only will Claire (Caitriona Balfe) be going on the road with Dougal (Graham McTavish), but so will Jamie (Sam Heughan). While this was a brief forty pages in the book, and the first two episodes covered 80 pages, this episode felt like it stayed close to the book in a great many respects. Again scenes were added, fleshing out parts of the story that were there all along, but they flowed seamlessly with the book and I suspect many of those who have not read the book in over a decade thought them original material. The Gathering was a fantastic episode for several of the relationships, with action and drama, and moments that quickly remind the audience that the 1700s contained very different realities and perils than the 1940s. 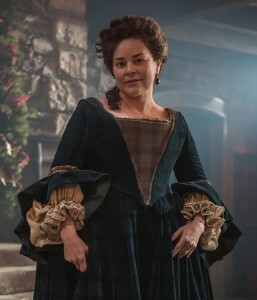 As an added bonus, and insider gift for keen-eyed fans of the book, the author Diana Gabaldon was in the Castle this week interacting ever so briefly with the characters she gave life to. The first season of Outlander will be 16 episodes, and with the announcement that Outlander has been picked up for a second season based on the second book in the series, Dragonfly in Amber, (and is expected to be 13 episodes?) we feel confident all 850 pages, and all 41 chapters of Outlander will be deftly handled during this first season which is, thus far, unfolding quite nicely. This entry was posted in Novel, Review, Television and tagged Caitriona Balfe, Diana Gabaldon, Dragonfly in Amber, Graham McTavish, Outlander, PopArtsPlace, Sam Heughan, STARZ on September 1, 2014 by A Novel Approach.